Land Destroyer: Globalist Theater: Pakistan & the "Arab Spring"
Globalist Theater: Pakistan & the "Arab Spring"
CFR, Brookings, & New York Times join forces with ABC to deceive the nation. Bangkok, Thailand May 16, 2011 - Richard Haass, the sloven Robert Kagan, and New York Times corespondent Anthony Shadid join Christiane Amanpour on ABC's "This Week" to give us a mind-numbing session of globalist propaganda. The utter farcical theater that is the West's mainstream "press." Topics covered include Pakistan, the "Arab Spring," and in particular the unrest in Syria. To truly appreciate this intellectually, morally, and factually bankrupt spectacle, it would help to understand the documented truth regarding these three topics to see just how far from reality these dark forces have departed. It would also help to understand who Haass and Kagan work for and what they really have to gain from the unfolding global conflicts. To begin with, the "Arab Spring" has been entirely engineered, planned, funded, supported, and executed by the United States. While Anthony Shadid attempts to foist once again the notion that the uprisings were spontaneous and indigenous, his own New York Times reported, "as American officials and others look back at the uprisings of the Arab Spring, they are seeing that the United States’ democracy-building campaigns played a bigger role in fomenting protests than was previously known, with key leaders of the movements having been trained by the Americans in campaigning, organizing through new media tools and monitoring elections." More recently in Syria, the US openly admitted that activists there were also trained and funded by the US. In a recent CNN article, acting State Department spokesman Mark Toner stated, "We're not working to undermine that [Syrian] government. What we are trying to do in Syria, through our civil society support, is to build the kind of democratic institutions, frankly, that we're trying to do in countries around the globe. What's different, I think, in this situation is that the Syrian government perceives this kind of assistance as a threat to its control over the Syrian people." In a recent AFP report, Michael Posner, the assistant US Secretary of State for Human Rights and Labor, stated that the "US government has budgeted $50 million in the last two years to develop new technologies to help activists protect themselves from arrest and prosecution by authoritarian governments." The report went on to explain that the US "organized training sessions for 5,000 activists in different parts of the world. A session held in the Middle East about six weeks ago gathered activists from Tunisia, Egypt, Syria and Lebanon who returned to their countries with the aim of training their colleagues there." Posner would add, "They went back and there's a ripple effect." The ripple effect, of course, is the current unrest unfolding in Syria today. Within this context we see that Shadid is either willfully lying to ABC's impressionable audience, or profoundly ignorant of the news even his own employer is reporting, entirely undermining his credibility in both instances. References to Egypt by Kagan and Haass are likewise laughable, as the entire movement was admittedly funded and trained by the US and the self-proclaimed leader, Mohamed ElBaradei is a trustee of yet another globalist organization, the International Crisis Group. Kagan and Haass both talk tough about Pakistan. At one point Haass declares that Pakistan is indeed no ally of the United States and that if they refuse to work with America, America will work "around" them. Kagan threatens to leverage India against Pakistan, inviting them to take over Islamabad's role in America's unending occupation in Afghanistan. Again, the truth of the matter is that there are open plans to incite unrest within Pakistan and carve it up into separate ineffectual states, interrupting the development of the entire region. Numerous calls by fellow globalist organizations call openly for instigating and supporting an armed insurrection in Pakistan's Baluchistan province. Yearly conferences are held at the Carnegie Endowment for International Peace headquarters in Washington D.C. on the very subject of Baluchi independence. Robert Kagan's brother, the equally sloven Frederick Kagan, articulated a plan where a destabilized Pakistan could serve host to a US invasion and occupation force, seizing Pakistan's nuclear weapons and then using US forces to take back destabilized provinces. In effect, it would extend America's unending occupation of Afghanistan into Pakistan. Such treacherous plans for Pakistan's future are already common knowledge throughout the Pakistani government, military, and their local media. While Western mainstream corporate-owned press maintains Pakistan's suspicions are paranoid conspiracy theories, the full reports can be seen for themselves, here, and here. Similar plans for Iran, such as the Brookings Institution's "Which Path to Persia?" report confirm that this posture, and in fact, utter contempt for the nation-state applies to all nations, including India whom Kagan assumes will be more than glad to take Pakistan's place as a regional US geopolitical proxy. It should be noted that Richard Haass is of the Council on Foreign Relations, while Robert Kagan is a member of the Brookings Institution and the Foreign Policy Initiative, (the Project for a New American Century re-branding). All of these organizations are funded, chaired, and operated by and for corporate-financier interests. Corporations such as Boeing, Northrop Grumman, Bank of America, Goldman Sachs, Cargill, Exxon, Chevron, Shell, etc., constitute the memberships of these organizations and in turn, these organizations represent their collective interests, manifesting themselves as policy and strategies that are presented to national governments for implementation. This in fact is the "international community's" real government and these policies are meant to expand corporate-financier interests via global economic and military hegemony, not pursue the best interests of the people tuning into the immensely disingenuous "This Week" presented by ABC. Concepts like "democracy," "terrorism," "freedom," and "human rights," are but the trappings that poorly dress what is in fact a global elite's neo-imperial agenda. 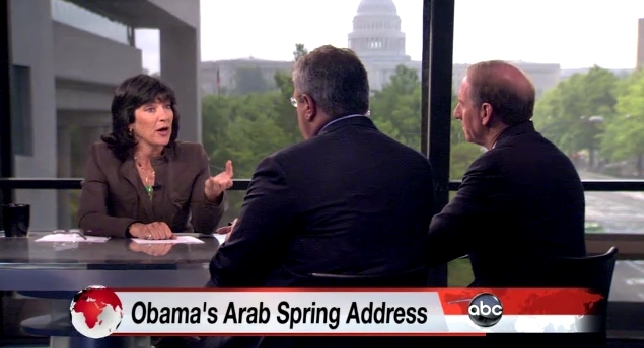 Which this background in mind, watch ABC's "This Week," May 16, 2011, hosted by Christiane Amanpour, featuring CFR's Richard Haass, Brookings Institution's Robert Kagan, and New York Times' Anthony Shadid. For more information about the real organizations and corporations that drive the global agenda, see "Naming Names: Your Real Government."